Peter Rogers - "Creating the Company"
Throughout his career, Peter has specialised in compliance management, business operations and project development. His senior roles as CEO, Operations Manager and Quality Manager within large national and international organisations have given him a unique perspective on management systems and processes. 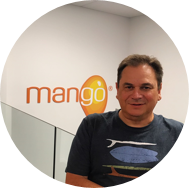 In 2002, with the emergence of Cloud technologies, Peter saw the opportunity to develop Mango after seeing a number of organisations struggling to keep up with their compliance paperwork and commitments. Many had inefficient paper-based or intranet-based compliance systems that were too hard to maintain or engage with staff. By working in close consultation with his clients, Peter created a simpler more dynamic solution to help businesses be more in control of their compliance requirements. Today, Peter focuses on sales execution, partner performance and product development. He continues to ensure that client requirements and requests are met and successfully incorporated into Mango.